When the car I was in pulled into Loreto Convent Primary School Mombasa, twenty years since I had been there, I knew the nostalgia would hit me hard; the neat rows of shrub, the lower primary classrooms on the far left of the parking lot, the corridor leading towards the music hall. It felt like I had been there the day before, memories of school plays and sports days coming back to me in such a powerful way. What I did not expect was the welcoming party that received me! A little girl with a bouquet of flowers almost twice her size looked up to me with pretty wide eyes as she handed me the roses and I was floored. A group of teachers lined up to greet me, shaking my hand warmly and then I recognized two who had taught my siblings and I in the 90s! I embraced Mr. Kodawa warmly, not quite believing he was still teaching there! Sister Gertrude, the School Principal who had invited me, a lady with a kind spirit and quiet authority, walked me past a group of students who were singing a song that said something about welcoming their daughter home. They shook their shoulders and stomped, making their way from the parking lot to the field where the event was taking place. The date, 8th August 2015. It was their prize giving day, and Sister Gertrude, had invited me to be their…wait for it…Chief Guest of Honour! Wait…hang on…the little girl who fought with boys and played on the climbing frame and sold wrestling stickers with her two brothers for some extra pocket money (we later got our butts whooped by our Dad so hard later that evening, I eventually lost the thrill for anything to do with WWF!) was now a Guest of Honour! I was not a model student while learning there, but I remember the teachers being patient, albeit militant, with us. It was a rare combination and one that, in hindsight, really helped in my character building. It also allowed me to trust adult supervision from very early on. After signing the guest book at the Principal’s office and meeting my fellow alum, a bubbly, smart lady called Josephine whose aunt was my classmate back in primary school and who would later speak passionately about hard work paying off, I was led through the hall where we would sometimes have assembly and out into the playing field, a vast expanse of memories. People had already congregated; parents, teachers, students. There was a high table that I was led to and I could not quite believe that, twenty years ago, I had craned my small neck trying to take a look at who the Guest of Honour was. Now here I was, seated in the middle, facing everyone, a wide array of expressions staring back at me. Expectant, curious, anxious, excited. It was surreal, but I composed myself and the festivities began. While I breathe I believe in The Cross. The words came out of my mouth with an ease that surprised me. It was as though Mrs. Mubiru, my former music teacher, was waving her heavy set arms in front of me again, emphasizing each word meticulously, pedantic about the right rhythm, the right tone of voice. I had to fight back tears. After taking a seat for the event to kick off and as the first few songs and shairis were performed, I took a moment not only to appreciate the invite to the occasion or to reflect on the years I had spent in the school, but on everything it taught me, lessons I still carry with me to date. Sister Reid (who is still alive and in her nineties but teaches in Nairobi) was a tough elderly lady who reminded us everyday that there is no shortcut to discipline and that discipline defines a person. Miss Adhiambo (who has since passed away), arguably the most feared teacher in the school, did not let us get away with disobedience and breaking the school rules. She put us all on the straight and narrow and taught us that living life with focus always paid off. Mrs. Mubiru (who is now retired) was arguably the finest music teacher at the Coast. She allowed us to travel the world and read the Bible through mellifluous song and well-worded prose, instilling, at least in me, a deep love and appreciation for music that I have to date. Sister Mary (who has since passed away) taught us about the Bible, emphasizing on faith rather than religion.There were many other teachers who taught us many other lessons, not just in the classroom, but on life. They may never know it, but these teachers changed my life. I rose to give my speech and told the parents that one of the best decisions they made was putting their children in that school. That even though I have made mistakes in life and I still have a lot of figuring out to do, I am all the more equipped because of the values I took with me from Loreto. I turned to the students and reminded them that every one of us has a purpose and even though they may not know what to make of that right now, they are on the right path, if they take advantage of the teachers and lessons from Loreto. The prize giving ceremony had some amazing categories; most improved student, sports player of the year and even parent of the year! We wound up the occasion by doing Sauti Sol’s Lipala Dance and I left the school with a big grin on my face. I had come back home and it felt like I had renewed my sense of purpose. I am a proud Loreto alum, I am a proud daughter of one the finest schools in Kenya! Who do you think you are...? It was nice hostting you back janet,Remember everything big was once small.The great rain Elijah prayed for and asked God to bring started from a small cloud that equalled the fist of a man.It was a good honor to come back home.fly girl,fly high! Oh it was so great seeing you all! God bless you and thank you for hosting me so graciously. A day I’ll never forget! Hi Janet, you wer two years my juniour in Loreto. I remember you back then, nice, bubbly, beautiful and friendly. I'm proud of you and May God continue showering you with his blessings. Amen. Janet you are such an inspiration and stand alone lady I treasure and admire my sister to be like, you are such an amazing person who daily ignites my spirit of being the best journalist ever in Kenya, Africa and the World at large. I am now pursuing Media studies and its my hope in less than two years I will be your assistant at Citizen. Janet you really inspire me and my two daughters…I keep reminding them that In this world you can be anything you want to be if you put your heart and mind in it. I went to Loreto – Valley Road. From class one to form four ?? I didn’t realize then, that I went to one of the greatest schools. Now, I am forever grateful that I did ?? Glad your were able to document this. We are so proud of you. We celebrate you. 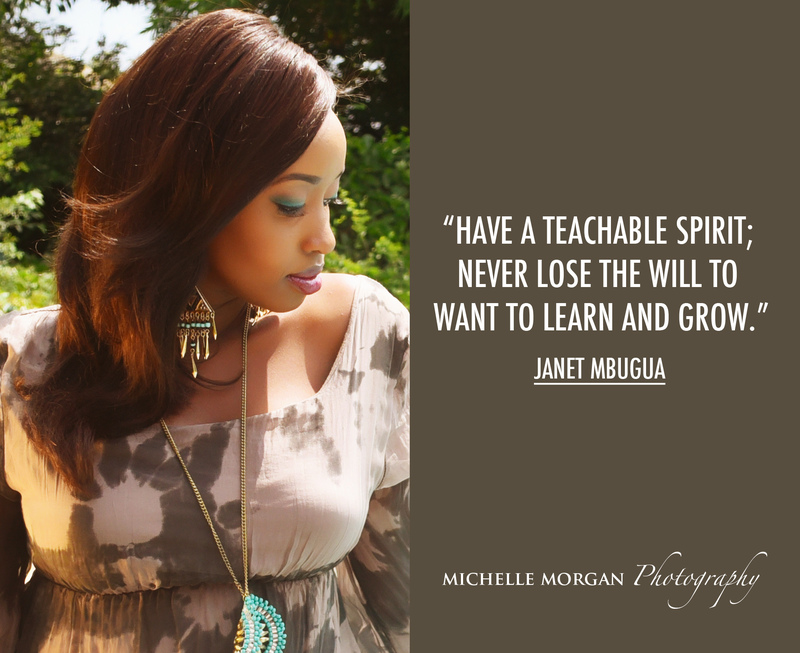 its like I know u already…..thank you Janet Dichu for opening this blog…u are an inspiration. Am used to reading blogs that advice me on how to take care of my body, face blablabla. If no one has ever told u how beautiful u r in and out…..i do. Janet your blog is real and it lets us in on how human you are and inspires those of us who are in our mid twenties, that yes indeed we too can get to where we want to be. Janet your blog is real and it lets us in on how human you are and inspires those of us who are in our mid twenties, that yes indeed we too can get to where to be. Thank you Janet for reminding us to remember what made us to be who we are today. I love your blog, its insightful. Janet, this takes me back 20 years… Mr. Kodawa, Sister Reid and the amazing Mrs. Mubiru… "Colored the world with gladness"! Definitely among the best years of my life. You are doing a great job being an inspiration to many… Congratulations and All the best! It was such a blessing to host you Janet as our guest of honor. This for was a dream come true! For one good year I had been thinking of how I could bring you back to your school, Loreto Mombasa! Your presence was an inspiration to the entire Loreto Mombasa family. We love you and we are proud of you Janet! God bless. Aren't you beautiful…you are a beautiful soul very beautiful! janet you are my role model. This journey Has really taken shape…and it’s Janet all the way…. May God always continue blessing you. Your blog is so real and inspiring. Hoping to meet you some day. Lots of love and Blessings?? Thank you Grace. Sometimes being honest is difficult but in the end, liberating! Thanks for reading my posts ? Oh thank you Rose! I’m humbled by your words. How old is your daughter? Give her my love. Yes, Loreto lives on!
? Asante Judith. Honestly I’m still figuring life out. Through mistakes we learn a lot and that’s ones thing I’d like to share, the lessons I’m learning. Thank you for making my blogging journey worthwhile! Reading thru this and all that’s going in my mind is how honoured I’d be to be a guest of honour at my former primary school or high school. This article really inspired me to be that person who deserves such an honour… a role model to kids. The pride that my former teachers would have in me. I’d love for them to see what Brian turned out to be! Thanks Janet! Keep up! I’m forever a big fan of you and your work! All the best and God bless! Thank you Brian! ? It was truly an honour. Maybe you can start from where you are today; talk to young people, find out if your former school needs help with any project etc. Not just because you would like the honour of being their Chief Guest, but because we owe it to the poeple who nurtured us, just to show them we haven’t forgotten them! All the best and thank you for reading my blog! Great way of recapping the beautiful memories. Thanks Carol ☺️And thank you for visiting my blog! Hi Susan! Oh she is so adorable! Thank you for your kind message. It was so great being back at Loreto! u r very inspirational janet if ur blogs are anything to go by…then 4 me am headed the right direction……I read ur blogs almost everyday and am very inspired….those children must have very excited…..u r my mentor…keep going…..much love…. Much love to you too, Victoria. I’m just learning to embrace everything that come my way, good or bad. I love sharing it with all of you. Thanks for visiting my blog so often! ? Glad to hear it! Thanks so much for reading my posts! This is sooooo awesome,I would like to be a guest honour of my old school one day. And those cute baby in red uniform only one word for them…"awwwwwwww" & ur baby bump double "awwwwwwww"
I know you did inspire the girls there, they did pick the right person to be the guest of honour. Thank you Tina! It felt to go back with a baby bump ? itbwasnsongreat seeing all those amazing children and their parents and teachers. Truly a blessing! Thanks for reading my posts ? I heart you too ? Wow, that was such an honour. You are an inspiration to women.